Do you want to experience incredible personal growth? Do you want to find more meaning in your life? Balance Life Coach Course: Full time and Online. Nico Liebenberg, MA (Psychology), a Life- & Executive Coach and creator of the on-line Balance4Coaches coaching system presents a coaching training program for anyone who wants to become an accredited Balance Life Coach. This life-transforming training is suited for people who want to master the basics of Life Coaching and start a full-time coaching practice as an accredited Balance Life Coach. The ultimate vision of the Balance Life Coach training is to equip people with fundamental knowledge to become Balance Life Coaches. Many people do this training, not to become Balance Life Coaches, but for self-development. Psychologists, Social Workers, Therapists, Counselors and Practitioners in the people helping industry who want to become Balance Life Coaches. HR and Training people who want to increase their people development skills. Corporate and Business Leaders who want to develop coaching skills to assist them in their mentoring relationships. Clergy who do coaching at their churches. Health Care Workers who wants to expand their range of skills in working with people. Teachers and lecturers who consider a career in coaching. People in their 40’s and older who are transitioning from being successful to being significant. People who want to pursue a career in Life Coaching. People who want to develop themselves or release more potential. Adventurous people who intuitively know they should do this training. This training program consist of the following. The full time course is presented in the East of Pretoria, South Africa, and consist of 6 different engagements, i.e. Access to the digital manual with teaching videos of all the Master Classes. In total there are 11 workshops on Saturdays 8h00-11h00. In total there are 4 socials, the last day of every term. In total there are 5 mentoring sessions with Nico Liebenberg, 1-hour/session. In total there are 5 life coaching sessions with Koos Franck at his office in Catherine Road, Shere, 1-hour/session. Students have full access to the digital manual. The digital manual is packed with coaching articles and training videos. None of these above mentioned engagements happen during school holidays. Debbie Jones schedules mentoring and coaching sessions for students. Mentoring and coaching sessions should be completed by the end of 2018. They are not transferable to 2019. The online course is presented online and consist of the following 3 engagements, i.e. In total there are 30 training sessions on Wednesdays 18h00-20h00. Online students join the class via Zoom. Online students have full access to the digital manual. The digital manual is packed with coaching articles and training videos. Debbie Jones schedules mentoring sessions for students. Mentoring sessions should be completed by the end of 2018. They are not transferable to 2019. Both full time and online students do assessments after their assignments. The graduation ceremony of the full time students takes place one week after the last training session. How NOT to do coaching? Section 2: What is coaching? Section 6: Coaching and who man is? How to sign up for balance4coaches? How to send a message in balance4coaches? How to take notes during coaching with balance4coaches? How to set up an agreement in balance4coaches? How to add coaching tools to balance4coaches? What is truth? Or, who is it? How to still our minds to be present? To whom do we listen in coaching? Section 22: What makes coaching effective? There are no formal requirements for registration. It will definitely help if you have a passion to help people grow. Love for yourself and other people. Willingness to engage with this personal journey of transformation. Commitment to the process of your becoming. Students can register with COMENSA – Coaches and Mentors of SA as Student Members. 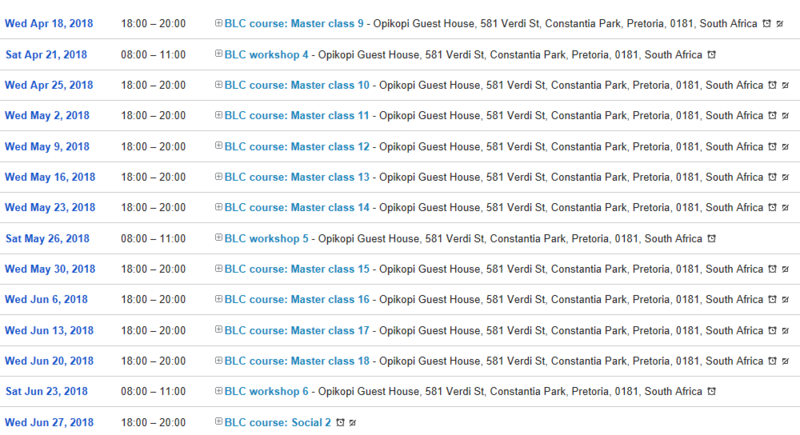 This training is presented at Opikopi Guest House and Conference Venue, in Constantia Park, in the East of Pretoria. R 22,350 per person, if 10 students register. R 21,360 per person, if 11 students register. R 20,040 per person, if 12 students register. R 18,830 per person, if 13 students register. R 16,620 per person, if 14 students register. R 15,740 per person, if 15 students register. R 14,860 per person, if 16 or more students register. A 10% deposit is payable at registration. The balance is paid in 11 monthly instalments. Students who withdraw from the program after they have paid their deposit will forfeit their deposit. Students receive an invoice the last Friday of every month. Invoices are paid the end of every month. Students will join the Balance Life Coach community on Facebook. Contact Debbie Jones at +27 (0)82 522 1841 or complete the contact form below and we will contact you.